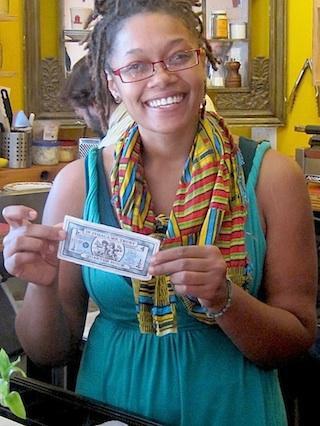 Ithaca Hours is a local currency system that promotes local economic strength and community self-reliance in ways which will support economic and social justice, ecology, community participation and human aspirations in and around Ithaca, New York. Ithaca Hours help to keep money local, building the Ithaca economy. It also builds community pride and connections. Over 900 participants publicly accept Ithaca HOURS for goods and services. Additionally some local employers and employees have agreed to pay or receive partial wages in Ithaca Hours, further continuing our goal of keeping money local. HOURS are printed on high-quality paper and use faint graphics that would be difficult to reproduce, and each bill is stamped with a serial number, in order to discourage counterfeiting. In 2002, a one-tenth hour bill was introduced, partly due to the encouragement and funding from Alternatives Federal Credit Union and feedback from retailers who complained about the awkwardness of only having larger denominations to work with; the bills bear the signatures of both HOURS president Steve Burke and the president of AFCU. While the Ithaca Hour continues to exist, in recent years it has fallen into disuse. Media accounts from the year 2011 indicate that the number of businesses accepting Hours has declined. Several reasons are attributed to this. First has been the founder, Paul Glover, moving out of town. While in Ithaca, Glover had acted as an evangelist and networker for Hours, helping to spread their use and helping businesses find ways to spend Hours they had received. Secondly, a general shift away from cash transactions towards electronic transfers with debit or credit cards. Glover has emphasized that every local currency needs at least one full-time networker to “promote, facilitate and troubleshoot” currency circulation. Several million dollars value of HOURS have been traded since 1991 among thousands of residents and over 500 area businesses, including the Cayuga Medical Center, Alternatives Federal Credit Union, the public library, many local farmers, movie theatres, restaurants, healers, plumbers, carpenters, electricians, and landlords. One of the primary functions of the Ithaca Hours system is to promote local economic development. Businesses who receive Hours must spend them on local goods and services, thus building a network of inter-supporting local businesses. While non-local businesses are welcome to accept Hours, those businesses need to spend them on local goods and services to be economically sustainable. In their mission to promote local economic development, the Board of Directors also makes interest-free loans of Ithaca HOURS to local businesses and grants to local non-profit organizations.